There is some weird car mojo out on Sunset near the Arclight today. 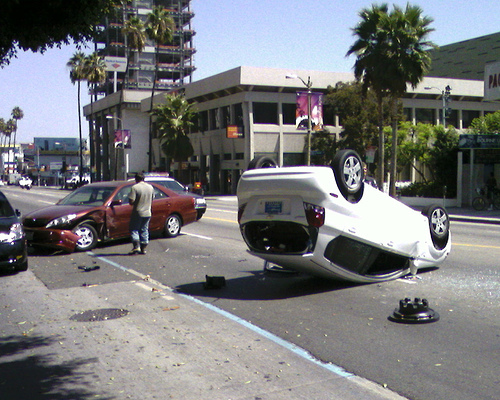 This morning, there was a 3 car accident in front of Amoeba; the three cars were facing sideways on Sunset in a row. About an hour ago, I was sitting in a meeting when I heard the sirens for a fire engine and an ambulance get louder and louder. 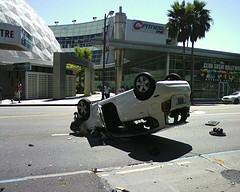 I looked out the window on Sunset, right across from the Arclight: a white car was overturned on Sunset. Sunset was closed between Vine and Cahuenga, so all kinds of traffic was backed up around the area. It is all cleared up now, like nothing happened, but I swear, I’m not driving that stretch of Sunset today. wonder what was going on. at first i thought maybe it was some sort of publicity stunt for a film….